South African art is healthy in terms of conceptualisation and meaning, the 2017 Sasol New Signatures exhibition proves. As a smelting pot, it’s no wonder South Africa has a thriving contemporary art scene. Our visual and style references have ties to so many world ideas, feelings, and anxieties that it all translates to interesting visual arts that emanates modern art in its fullest. But it’s competitions like Sasol New Signatures that really help artists working with more modern ideas to show what is making young artists tick – something that has left the competition’s national chairperson Dr Pieter Binsbergen grinning from ear to ear. The 2017 competition served up finalists and merit winners who used materials and ideas to create multi-sensory pieces that not only held the judges captive, they will also fill viewers with the same sense of awe. The latest inaugural New Signatures exhibition moves between being analogous and the exact opposite – and that is what makes a visit to the Pretoria Art Museum worth your time and attention. The mix of sculptures, installations, portraits and the variety of pieces shows that there were many approaches to the 2017 theme Be Discovered. The winning work, after all, was an animated film, made from silhouette cut-outs of artist Lebohang Kganye’s family, combining props in a diorama that tells different stories. While you can approach it as a short, animated film, it’s not. Each cutout was carefully selected and created for the purpose of the film, and it follows on from Kganye’s previous works where she used life-size photographic cutouts. “I wanted to move from lifesize to more intimate cutouts. I was travelling in South Africa to find out what my actual surname is. There’s four varieties, for instance, and through that the story eventually became more about my grandfather. “He was the first member of our family to eventually move from the farms to the city, leading more people from the family to finally make the move, so I wanted to create all these stories about him,” she explains. It’s this keen combination of mediums that led her to a win. Her prize includes a solo exhibition coinciding with the 2018 New Signatures exhibition. Other artists that really pushed boundaries include merit winner Francke Gretchen Crots, Carol Anne Preston and Cara-Jo Tredoux. Crots created a ceramic booklet called Doctor Crots’s F***ed Up Anatomy. While the book depicts illustrations of the human body – all of it is irrelevant – it’s the emotions you feel while paging through the book that creates an interesting feeling of unease. There’s a heightened sense of caution while handling the work. It speaks about how disposable humans are. Preston similarly created a work that engages with whoever stops to look at her installation, titled Cacoon. Made from metal shavings she collected from dustbins, the cacoon structure hides a mechanised motor that works with a motion sensor. When you approach the piece it starts to vibrate and scatter shavings – leaving you with the impression it is destroying itself as it works. That volatility creates a narrative between the piece and whoever activated the sensor. Tredoux, on the other hand, created something unexpected – a hyper realistic painting that stands out next to its contemporary family. “There’s still a place for traditional media, and the world still needs bloody good paintings,” Binsberger explains about the piece. What makes the piece – Wandering – so unique is that at first glance you think it’s a photograph, but as soon as your realise it’s oil on wood, the painting starts to draw you in. The subject is the abandoned (and possibly haunted) hospital in Kempton Park. 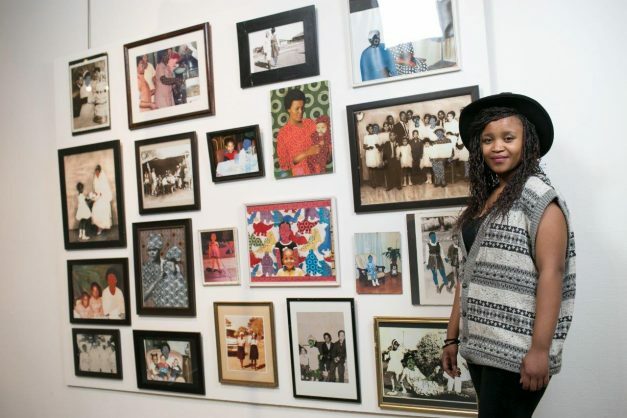 Fellow merit winner Goitseone Moerane also used an interesting mix of materials to create a family portrait wall that questions the role of females in Tswana culture. Entitled Mosadi o tswara thipa ka bogaleng (roughly translated to “a woman holds a knife by the blade”), it explores gender and cultural prejudice by using Shweshwe cloth to replace women – a metaphor for what women are expected to be in domestic settings. It is an exhibition worth a visit and if you want your fill of what artists are thinking right now, you know where to go.